As I revised the outline for “The Most Popular Operas” (a course I teach here at the University of Toronto School of Continuing Studies, beginning September 18th), I was asked as usual to recommend books. I used to suggest Roger Parker’s Oxford Illustrated History of Opera (1995), a solid and well-written work. But I believe it’s been supplanted by a new book, namely A History of Opera (2012) by Carolyn Abbate & Roger Parker. Yes, it’s the same guy + a collaborator, and so it shouldn’t surprise us that the new book has a chattier feel to it. It’s not so dry, and actually lots of fun. In comparing the two books, and as I prepared to teach again, I began to think about opera books in general. Someday I might like to try my hand, although my contribution would be much more specialized. Yes, there are many different sorts of books. They succeed –which is to say, find an audience—because there are so many different sorts of readers. But it starts with the different sorts of authors and what they might have to say. I am inclined to go back to the beginning, which is to say, the history book that is my touchstone for theatre history. In my M.A. at the Graduate Centre for Study of Drama, Professor Lise-Lone Marker relied very heavily on one book, namely A.M. Nagler’s A Source Book in Theatrical History. I took this course a long time ago, but the book’s still available, still a landmark of sorts. Why? Because we’re reading the words of witnesses & participants from the time. The analyses of modern-day writers are never going to have the authenticity of this kind of material. 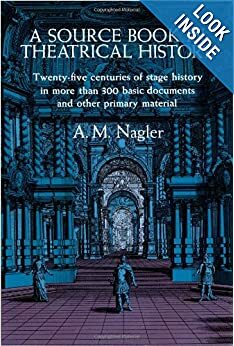 Nagler’s book doesn’t have a great deal about opera in it (although there are a few), indeed I believe that opera’s sparse inclusion is perhaps the largest blemish upon this book; as such it might seem like an odd candidate to be mentioned. But I cite Nagler more as an example of genuine historical specimens, historiography done right. Let me get back to Parker vs Parker/Abbate. There are new things in the new book, which is as it should be. Anyone reading about the beginnings of opera in other histories could be forgiven for finding it all a little unbelievable, a little too perfect. If the history of opera were an account of a murder, any decent cop would have noticed that the tale makes good use of all available evidence. If you want to read one of those, go to Wikipedia for example; but books & historical accounts (mine included) haven’t been much better, so let’s not be too hard on wikipedia. What I love about Parker-Abbate’s beginning is how it’s framed not as the beginning of opera so much as the beginning of the telling of the history of opera. We are confronted with the limits of what we know and ironically presented with centuries of myth-making, the way opera has been understood. They present a series of specimens, including Richard Wagner, telling us variants of the story. They’re all perfect as setup for the joke. No it’s not a colossal laugh although I would imagine scholars may have chuckled. I recall reading this with my mouth hanging open. And I had the impulse to applaud. So yes, this is perhaps the biggest quote I’ve ever put into this blog. Thus according to the established historical account, was opera born and started its 400-year progress. But in the latter part of the twentieth century the picture was modified in significant details. Scholarly research gave rise to a more complex description, almost an historical anthropology of the phenomenon. Nowhere was this more evident than in accounts of opera’s first decades. The story still portrayed opera flowing from an important moment of change in Italy around 1600, but the details could take us aback: for instance, the very designation ‘opera’ was not consistently used until as late as the nineteenth century. An impressive list of genre terms used in opera libretti or scores at various historical periods in various centres or national traditions can be reconstructed, and these differences in terminology reflect important variations in the very nature of the works. One recent history of opera in seventeenth-century Venice lists around fifteen terms that circulated in the early decades, few of which include the word ‘opera’, and only some of which make reference to music. It could be attione in musica or a drama musicale or a favola regia, a tragedia musicale or an opera scenica; the sheer proliferation speaks of a genre in the making. I’d keep it going if it didn’t make my own writing seem impoverished and weak in comparison. This is a whole new way of seeing that opening chapter of the history of opera. Their charming conversational tone is a pleasure to read. If I have a quibble –and it’s a biggie—it’s how I feel about their response to the last century, a colossal omission or perhaps simply an error in their choice of focus. I must frame it within my own beliefs about opera, so that you can decide whether I can be trusted. I love teaching opera as a series of debates, or conversations if you prefer. These change throughout history. In the first century of opera the composer is barely in the picture, when we recall that musicians were usually servants, that opera performances sometimes employed substitute arias & solos pulled out of a suitcase. There was no textual integrity because there was barely any text, period. Publishing came later. The conversation at one time was really between the librettist and the virtuoso, whereas in another later century, the composer became the most important figure. And now? The most imposing figure in modern opera productions is the director: although you’d never know it from reading Parker & Abbate. Their focus is on text, which makes sense. They wrote a big honking book. How could they concern themselves over the evanescence of performance? The ephemera of high notes or interpretations? But that’s just it. While they would love you to see opera as a bunch of books –which is what you find in a music library—that’s a very narrow perspective, particularly in this century of convergence. Opera is both the works and the performers, the songs & the singers. To focus only on the works is to miss a great deal of the story, particularly now as opera turns up in movie theatres & TV. Now maybe they were concerned that the book was LONG. I can’t argue, even if i want it longer to include what’s missing. Honestly, yes! So… How to tell the history of opera? go to opera. See the productions, quibble with them, discuss them with your friends. That’s where any art form lives. 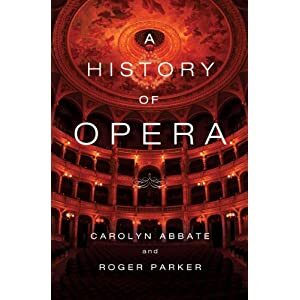 This entry was posted in Books & Literature, Opera, Personal ruminations & essays, Reviews and tagged A History of Opera, Carolyn Abbate, Oxford Illustrated History of Opera, Roger Parker. Bookmark the permalink. I found Abbate and Parker quite interesting, especially on early opera, but frustratingly dismissive of everything post Puccini. It also seems to be premised on the idea that opera exists in a political, social and commercial vacuum. “The Gilded Age: A Social History of Opera” by Daniel Snowman is rather better in those respects though it doesn’t have the musicological details of A&P. Thanks! i’ll have to give it (Snowman) a look.